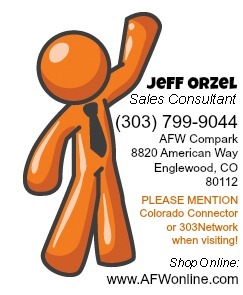 Special thanks to Mr. Jeff Orzel, Sales Consultant at American Furniture Warehouse - Compark! Jeff gets our vote as the friendliest, most knowledgeable, hardest working sales professional in the home entertainment/media and furniture industries! 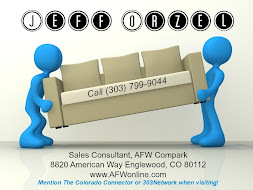 Whether you need to update your home office, integrate a top of the line Home Theater, re-furnish your home, or invest in a quality sleep system, Jeff's exceptional ability to listen carefully to your needs and wants and match you with the right products is outstanding. With weekly sales specials and new products being added daily, you are sure to find the items to meet your home media, office, and furniture needs at American Furniture Warehouse. With Jeff as your expert consultant you are guaranteed to have a great buying experience. Never pushy, and always informative, Jeff will help you work within your budget to get exactly what you need and walk away happy. 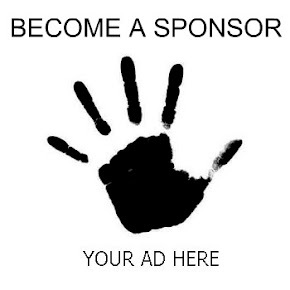 Mention 303Network and/or Colorado Connector! > Enter code "CJO" when ordering. 303Network Denver, Colorado from Cityvids Dottv on Vimeo. The 303Network is THE hottest networking group in Denver and produces monthly mixers for creative, corporate and entrepreneurial folks. Great opportunity for individuals to experience a networking mixer and meet individuals for business partnerships, sales leads, new business or even a new job.